One of the great things about Scran becoming part of Historic Environment Scotland (HES) is that as well as having over 500,000 amazing digitised records to showcase, we also now get to work with over 300 Properties in Care. This is the technical name for the 300+ important historic buildings and monuments that we look after on behalf of the Scottish public. These range from huge enterprises such as Edinburgh Castle and Stirling Castle, to standing stones such as Machrie Moor and stately houses such as Duff House. 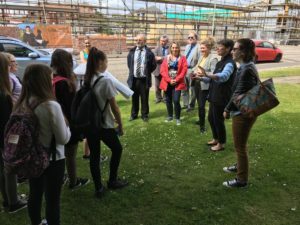 I got the chance to visit one of our properties, Arbroath Abbey in Angus, last week and see the amazing work that had been done by a group of young students from Arbroath Academy. Calling themselves the “1,2 History Crew”, they are a group of eight S1 and S2 pupils who formed a Friday afternoon after-school club. Colleagues from Scotland’s Urban Past (an HES project funded by the Heritage Lottery Fund) and HES itself offered the group an opportunity to design a heritage trail around the ruined Abbey for family visitors. 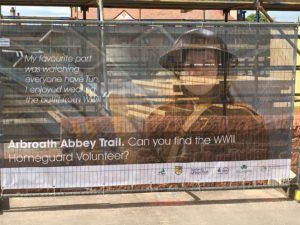 The trail highlights aspects of Arbroath’s past such as the harbour, Signal Tower & Bell Rock Lighthouse, Arbroath Abbey, Arbroath FC, the WWII Drill Hall, shipwrecks, Arbroath smokies and the Declaration of Arbroath. The History Crew researched these historical sites, events and objects, and then chose historical characters linked to their area of interest and went out and about in Arbroath for a historical ‘photoshoot’. Using the information and photos, the group chose to create a geocache-style trail for other young people to learn about Arbroath’s heritage, creating bookmarks and working with a local artist to design ‘seals’ linked to their sites which were turned into stamps. Stamps and bookmarks then became part of the trail, and these were hidden in different locations round Arbroath Abbey to create the Arbroath Abbey Trail. 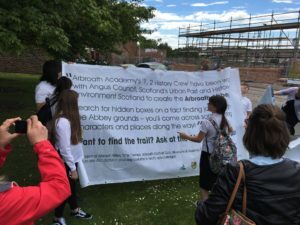 The group then put together and delivered a presentation for pupils from Hayshead Primary School, inviting them to Arbroath Abbey for the launch of the trail. They planned the launch event and hosted P7 pupils, leading groups around the abbey to test the trail. 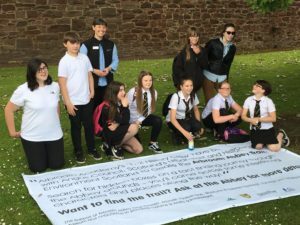 Angus Council offered the group an opportunity to produce banners based on what the young people had created, for display on fencing surrounding a new housing development near the abbey and these were unveiled on 22nd June. The project enabled the young people from the Academy to explore what their local heritage meant to them, take pride in it and to share it with others. They developed in confidence, and in addition to the creative aspects of producing the trail, the experience of planning and carrying out an entire project was really beneficial to them. They all had the opportunity to develop leadership skills during the afternoon with the primary pupils, and this was the first time that most of them had taken on the role of leading a group. As well as the efforts of the pupils, thanks are due to Fiona Davidson, HES Learning Officer, Tracy Morgan, a youth worker at Angus Council, and Fiona Watson of Scotland’s Urban Past. 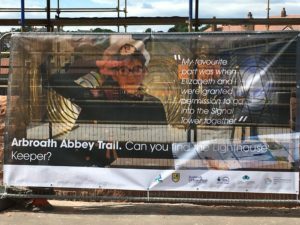 The trail itself is now available for visiting families and young people to try when visiting Arbroath Abbey on Saturdays.